This colorful range, inspired by the rich tones of the Mediterranean, offers superb performance, and is characterized by the clean lines typical of professional kitchen design. PORTOFINO COOKER Boundless Italian Style • Triple fan technology • Green cooking: Optimal cooking results with low energy consumption (A+) • 126L XXL oven cavity • Ergonomic knobs • Isothermal proof cavity • Extra bright • LCD display • Soft close system • Pyrolytic & vapor cleaning *The splash back & Portofino hood is not included in the offer. “This la mb vind great for thos aloo recipe is e who li ke a bit of heat ”, says de signer, Froil an . 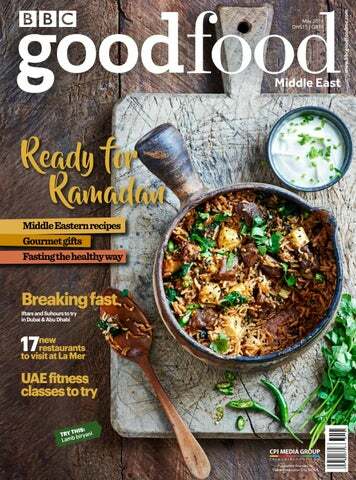 BBC Good Food ME magazine is published by CPI Media Group under licence from BBC Worldwide Limited, 101 Wood Lane, London W12 7FA. The BBC Blocks are the trade mark of the British Broadcasting Corporation. Used under licence (C) Immediate Media Company Limited. All rights reserved. Reproduction in whole or part prohibited without permission. 4 YOUR SAY We love hearing from you, so why not write to us with your views and comments. 6 NEWS NIBBLES The latest food news from the region and around the globe. 10 FLAVOURS OF THE MONTH The best restaurant offers and events happening in the region this month. 14 EAT OUT: ABU DHABI Must-try restaurants in the capital. 16 TRIED & TASTED We review four of the city’s top tables. 22 DINING OUT THIS RAMADAN Our round-up of some of the best Iftars and Suhours in the UAE this Ramadan. ✴ Home cooking 32 RAMADAN READY Experience the breaking of fast with loved ones at home this Ramadan with these traditional recipes with a twist. 40 SPICE WORLD RECIPES Take a tour of the world’s spice capitals with these fragrant recipes. 54 BOOST YOUR ENERGY This nutritious breakfast, lunch and dinner menu is sure to give you a energy and a health-kick. 60 DINNER PARTY DESSERTS Desserts don’t have to be challenging. These make-ahead sweet recipes are perfect for making when you have friends over. 54 ✴ Gourmet lifestyle 58 HEALTH NEWS Health and fitness news for getting into tip top shape. 63 TIPS FOR HEALTHY SKIN If you’re looking to sustain healthy, glowing skin, these top tips could help. 60 FITNESS CLASSES A round-up of some of the latest places around Dubai to get your sweat on. 71 A 2-night stay at La Ville Hotel & Suites. 72 A 3-night stay at The Residence Mauritius. 73 Dining vouchers, kitchen goodies and more up for grabs. Our recipe descriptions Suitable for vegetarians. You can freeze it. Not suitable for freezing. Easy Simple recipes even beginners can make. A little effort These require a bit more skill and confidence – such as making pastry. More of a challenge Recipes aimed at experienced cooks. Low fat 12g or less per portion. Low cal 500 calories or less per main. Indicating recipes that are good sources of useful nutrients. GLUTEN FREE Indicates a recipe is free from gluten. Some recipes contain pork & alcohol. These are clearly marked and are for non-Muslims only. Look for these symbols: P Contains pork. Contains alcohol. BBC Good Food ME, thank you for the recommendation to dine at Il Ristorante - Niko Romito at the new Bulgari Hotel. My husband and I went there for date night last week and absolutely loved it. As described, the al fresco terrace almost transports you outside of Dubai to somewhere in Europe. The prices are much more reasonable that I expected and we loved the simplicity of the food and focus on quality ingredients. Please keep the recommendations coming! s a mother of three, I find it difficult to stay on track when it comes to eating healthy and working out. With a full time job and a never-ending list of things to do with the kids, I feel like I’ve really been neglecting myself recently and I’ve made a promise to myself to try and change that! Helping me to do so is your trusted list of ‘healthy restaurants to try’ in your April issue, and the quick to make recipes – they really assist when it comes to planning, or knowing where to pop into when I’m out and about, as opposed to grabbing a quick (very bad for me) cheeseburger for convenience. I really look forward to the new suggestions, so thanks BBC Good Food ME. 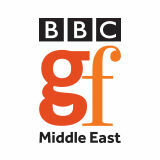 Or, you could write to us at: The Editor, BBC Good Food Middle East. Grosvenor Business Tower, Barsha Heights, Office 804 PO Box 13700, Dubai, UAE. A reflection of true Ramadan hospitality. Experience this auspicious occasion at the worldâ&#x20AC;&#x2122;s tallest 5-star hotel with three delectable Iftar options starting from sunset to 8.30pm. Al Fanous at Dubai Ballroom: Iftar buffet, AED 215 per person Kitchen6: Iftar buffet, AED 225 per person Rang Mahal by Atul Kochhar: 3-course Iftar set menu, AED 225 per person Childrenâ&#x20AC;&#x2122;s policy applies. For bookings below 50 people, call +971 4 414 3000 or email jwmmrr@marriott.com. For Corporate Iftars above 50 guests, call +971 4 414 2000 or email jwmarquis.dubai@marriott.com. La Mer, the beachfront dining and lifestyle destination located between Pearl Jumeirah and Jumeirah Bay, has added 17 brand new concepts to its existing 71 outlets over the last couple of months. The additional new eateries have expanded the range of cuisines from around the world available at La Mer. Among the additions, there’s P.F. Chang’s that serves Chinese food the American way, steak restaurant Texas Roadhouse, Roman-style pizzeria Alice Pizza, French deli Pomme de Pain, Five Guys, the American burger restaurant, and Kaftan, the purveyor of traditional Ottoman and modern Turkish cuisine. The recently open AçaiXpress offers healthy options, and incorporates the Brazilian acai berry into its menu. For something different, sample Asian food with an Emirati twist at Street Style by Gossip, try new flavours of bubble tea at Booba, or enjoy a quick bite at one of the new urban street food outlets including Pretzel World, Roti Rollers and The Chickery. Sports fans can enjoy live game coverage and American cuisine at Stars N Bars. And, for those with a sweet tooth, indulge at Creptastic, where you’ll find a wide range of crepe flavours, or head to HEIK Knafeh Culture, which offers an unconventional take on knafeh. In addition, The Inventing Room offers an exciting experience with flavoursome ingredients, such as exploding whipped cream and burnt marshmallow fluff, prepared using liquid nitrogen, while Tart Bakery, Dubai’s newest patisserie invites you to experience and appreciate the art of tart. Vicens also opened its doors at La Mer, bringing its long nougat traditions to the city. For more information, visit lamerdubai.ae. Caesars Palace is coming to Dubai The Las Vegas-born favourite will open six ‘celebrity’ restaurants at new Bluewaters island Expected to open during the fourth quarter of 2018 on the new Bluewaters manmade island opposite Jumeirah Beach Residence, Meraas has revealed that Caesars Palace will make its Dubai debut, representing the world’s second property in addition to Las Vegas. Six new restaurants will open at the new 178-key Caesars Palace, which are said to be celebrity-driven and all boast world-class entertainment elements. There will also be a new beach club. To facilitate access to Bluewaters, Meraas has developed, in cooperation with Dubai’s Roads and Transport Authority, a bridge that connects Bluewaters directly to Sheikh Zayed Road. We’re told that a group transit system will also become operational to shuttle passengers in fully-automated vehicles on four-minute trips between the island and Dubai Metro. The island will also connect with The Beach via a 265-metre pedestrian bridge. TOP PRODUCT We love this new retro SMEG FAB50 fridge! Making the perfect statement to any home, this bold and curvy retro-style, double door refrigerator comes in a variety of colours including pastel blue as pictured. With a total gross volume of 467 litres and a freezer capacity of 5.5kg, this brand-new fridge features unmistakably vintage designs whose classic, curvaceous lines and beautiful colours combine with cutting edge technology. Priced at Dhs11,670, the SMEG FEB50 is now available at all Better Life stores across the UAE. See betterlifeuae.com. WHIPPED BAKERY OPENS DOORS Locally homegrown brand, Whipped Bakery has opened its first flagship shop in Dar Wasl Mall on Al Wasl Road. Known for specialising in scrumptious American desserts and treats including cookies, slices and bakes, peanut brittle, and giant jars of homemade salted caramel, Whipped Bakery is spearheaded by American expat and baker, Gina Pistone, who launched the brand in 2014 at the artisan Arte Market. Open seven days a week from 11am to 10pm, the store is now fully operational. For more information call 058 532 7401, e-mail info@whipped.ae or visit whipped.ae. Sprüngli, a premium chocolatier from Switzerland has opened a stand-alone boutique and café in The Dubai Mall. This is the chocolatier’s second branch opening in five months following its success at the The Galleria Mall on Al Maryah Island in Abu Dhabi. With Sprüngli products only exclusively available in their own boutiques, expect to find artisan crafted products from Switzerland in-store including the Sprüngli macaroon ‘Luxemburgerli’, pralines and truffles, plus their popular hot chocolate, aromatic coffee and tea. Sprüngli also offers chocolates exclusive to its UAE customers, such as the coconut truffle or the Sprungli Logo praline in milk with an almond gianduja filling. Pay it forward this Ramadan In the spirit of giving during Ramadan, Rove Hotels will be giving all guests to its Iftar meal a voucher with the value of an additional Iftar meal to use at The Daily restaurant, as part of a ‘pay it forward’ initiative. With the given voucher, guests can then ‘pass it on’ by sharing it with family, friends or those whom they feel deserve a good deed. Rove Hotels has also partnered with Mawaheb, a Dubai-based art studio who work with adults and teenagers of determination (members pictured). Mawaheb’s aim is to bridge the gap between society and the determined ones in a creative manner by providing the artists with an opportunity to develop life, social, and communication skills through the medium of art. Visitors to The Daily will also have the chance to deposit their vouchers inside one of the boxes showcasing the Mawaheb art located within each one of the hotels for the artists and families to enjoy. To join in, visit The Daily at any of Rove Hotels (Rove City Centre, Rove Trade Centre, Rove Healthcare City and the newly opened Rove Dubai Marina) to enjoy an Iftar buffet, inclusive of traditional Ramadan juices and dishes for Dhs99 per person. Visit rovehotels.com. Here is what’s hot and happening around town this month. New on the block î Hotel Cartagena, JW Marriott Marquis Dubai The bohemian, flamboyant, Latina American doors of Hotel Cartagena are now open on the 72nd floor of JW Marriott Marquis Dubai. Comprising a restaurant, lounge and bar, the exuberant new spot is described as an urban jungle full of exotic plants, garden gnomes, pink flamingos, vintage books, parrots and peacocks. The cuisine here is said to be ‘Latin without borders’, offering a tour of South America and the Caribbean islands. Hotel Cartagena is open daily from 5.30pm to 3am, and from 1.30pm on Fridays for its newlylaunched brunch. See hotelcartagena.ae. Bao Wow is an Asian street-food concept now open at City Walk. The restaurant’s menu incorporates traditional and modern dishes from China, Japan, Korea, Singapore and Taiwan. The name Bow Wow is inspired by steamed buns filled with an array of delicious fillings that are the restaurant’s signature dish. Dishes on the menu include steamed gyoza with chicken presented on smoky dry ice, maki rolls, assorted dim sum, stir-fried Singapore-style vermicelli noodles with pak choi, shallots and curry powder, and beef ramen, made from three different types of stock. See @baowowdubai on social media. î Five Guys, Al Seef Five Guys has opened its sixth restaurant in the UAE at the charming new district Al Seef, located on the banks of the Dubai Creek. Five Guys offers 100% customisable Halal burgers and hotdogs with up to 15 free toppings, grilled cheese sandwiches, veggie sandwiches, fries, and customisable milkshakes in its brand-new location. Everything is freshly prepared and made to order, from hand-cut fries right through to the patties prepared daily from 100% Halal beef. See fiveguys.me. î Emirates Central, Emirates Golf Club WHERE TO GO FOR A ROAST DINNER…. î The Lion by Nick & Scott, H Hotel The newly rebranded British pub, The Lion by Nick & Scott has introduced two weekly brunches. First up on Thursday nights, groups can indulge in a Dhs300 package that includes a platter of starters to share with an individual choice of main and dessert. They’re also offering an extra hour of beverage brunching for Dhs100. The menu is set to change on a weekly basis but will serve up the best of Nick & Scott’s British recipes to offer UK favourites such as a traditional roast dinner, fish and chips, crushed peas and tartare sauce, beef in Murphy’s pudding with mash and gravy and curried coconut chicken, cardamom rice and naan bread and a selection of desserts. Secondly there’s a Friday brunch. Performing a weekly three-hour set, the Friday brunch welcomes Richard Simon Kennedy a singer and guitarist who has performed the London circuit at venues such as Ronnie Scott’s, Jazz Club and The Boileroom – bringing modern versions the best British tracks, from the 70’s until now. Thursday brunch is from 7pm, whilst Friday brunch is from 3pm to 6pm and is priced at Dhs300 for three hours with house beverages, plus Dhs100 for an extended house of beverages. For more information or to make a reservation, e-mail book@theliondubai.ae. On May 19, a special Royal Wedding Brunch will be held at the Emirates Central between 1.30pm to 5pm, with a range of packages available, to see Prince Harry marry Meghan Markle. Prices start at Dhs299 for food and soft beverages, Dhs415 with select house beverages, Dhs475 with sparkling and Dhs685 with champagne. Children between 7 to 12 years can enjoy the festivities for Dhs90, with under 7’s dining for free. Starters will include a range of traditional fresh sandwiches such as cucumber & cream cheese, egg & cress and beef & horseradish, plus crisp garden salads and hot snacks such as cheese puffs. For mains, take your pick of British classics, such as whole poached salmon, sliced roast beef and homemade Coronation chicken, with sweets including profiteroles, apple pie, banoffee pie, cheesecake, trifle and tarte au citron, to conclude. There will be prizes for the ‘Best Dressed’, including dinner at the newly opened carine restaurant and Jones the Grocer. For more information or reservations, call 04-4179999 or e-mail emiratesdining@dubaigolf.com. î The Scene, Pier 7 The Scene is set to host a ‘proper royal wedding watch party’ with all things quintessentially British from afternoon tea, bunting displayed in red, white and blue, and face painting for kids. With the occasion live on TV from 1pm, enjoy afternoon tea with a G&T (Dhs175 for five beverages), or if you’d like to start the celebrations early, come to the ‘Rehearsal Dinner’ on May 18 and enjoy the ‘Wellington for 2’ deal, priced at Dhs249 per couple. For more information or to make a reservation, call 04-4222328. Bread Street Kitchen & Bar is introducing Gordon Ramsay’s Roast Revolution to Dubai, with a new Saturday roast offering for Dhs135 per person between 12pm until 4pm every week. As well as the individual roast offering, Bread Street Kitchen has also launched a new ‘Host My Roast’ dining option, which is available for groups of six or more to experience a delicious roast dinner with none of the required effort of cooking for a large group for just Dhs750 (Dhs125 per person). Diners can look forward to roast sirloin of beef, accompanied by all the usual trimmings such as Yorkshire pudding, roast potatoes, cauliflower cheese and many more traditional sides. In addition, guests will be treated to a complimentary taster of Gordon’s favourite childhood dessert, the English trifle. For more information or to make a reservation call +971 4 426 1000, or visit atlantisthepalm.com. î BiCE, Hilton Dubai Jumeirah In honour of the royal wedding, BiCE at the Hilton at Jumeirah Beach Residence is hosting a special Saturday brunch. In formal, fancy fashion, guests of the brunch are encouraged to wear their finest attire to watch the wedding of the year from big screens, while enjoying a three-course British-themed set menu with free-flowing beverages. Taking place from 2.30pm to 6pm on May 19, the brunch is priced at Dhs450 per person. For more information or to make a reservation, call 056-1882766. Starters Eating out TWO NEW BRUNCHES TO TRY! î Katsuya by Starck, The Dubai Mall After the successful launch of its stylish Japanese restaurant at the Jumeirah Al Naseem Hotel, Katsuya by Starck has re-opened at the new Fashion Avenue extension at The Dubai Mall. Open for both lunch and dinner, Katsuya by Starck boasts a menu dedicated to Japanese flavours, featuring highlights of specialty mocktails, delectable Robata grills, maki rolls and sushi platters, all carefully prepared by Katsuya’s team of culinary experts. Choose to be seated indoors at the ultra-trendy sushi bar and restaurant area, or outdoors on the terrace while catching views of the Dubai fountains. For a more intimate affair, Starck’s carefully designed ‘private dining area’ is the perfect place to celebrate a special occasion or simply indulge in a Katsuya feast with your loved ones. For more information, see katsuyarestaurant.com. French-inspired bistro, Demoiselle by Galvin has launched a wholesome new lunch menu. The meal commences with a soup of the day, while main courses call for a range of options to choose from, with highlights including smoked beef pancetta, with crème fraiche, shallots and rich Gruyere cheese. One to not miss, a breakfast inspire lunch special – warm poached egg, heritage beetroot, walnuts, rocket and balsamic dressing. For those looking to truly indulge in a Demoiselle classic, one can opt for the Demoiselle club sandwich, both nutritious and delicious. Complete the balanced lunch offering with a cup of artisan coffee, fresh summer juices or select from a range of Demoiselle’s signature tea collection. Demoiselle by Galvin’s lunch menu is priced at Dhs53 per person and is available every day from 12pm to 3.30pm. For more information or to make a reservation, call 04-5905076.
î Levee, La Mer If you’re looking for a weekend spot to start your day with a hearty meal, great seaside views, and lovely morning ambiance, head to Levee, La Mer’s newest culinary gem for authentic French Mediterranean cuisine. Situated right by the beach, welcome the day with a cup of premium coffee roasts or better yet, a dose of vitamins with freshly squeezed juices. The venue also serves delicious breakfast favorites like acai bowls complete with homemade granola, classic French toast, shakshuka eggs, morning bagels, and a wide array of freshly baked bread and pastries. For information and to make a booking, call 04-380 2000 or e-mail dine@leveecafeandlounge.ae. Looking for a new brunch to try on Friday? Get ready to embark on the ultimate carnival experience at the newly launched Brunch by Asia de Cuba at the Westin Dubai Mina Seyahi Beach Resort & Marina. Set across two floors of dining space, the Chino-Latino eatery, is transformed every Friday into the bustling streets of 1950s Cuba, boasting a vivacious and fun atmosphere, exquisite free-flow cocktails and delicious food stations to explore. Upon arrival, expect three food boxes to the table. These include a ‘Snack Box’, containing Latin American favourites like ropavieja spring rolls and empanadas, an Asian inspired ‘Sushi Box’ and the ‘Duck Set’, which comes complete with roasted peking duck, pancakes, guava hoisin, leeks and cucumber. Offering a selection of the menu’s signature dishes, you can then indulge in the restaurant’s best-sellers such as the tuna pica tartare, the ceviche and sushi bar, buckets of fresh lobster, prawns, seafood and salads - whilst upstairs tempts with the dedicated El Lochón station, an El Wok station (serving up Asian classics with a twist) and the El Carving station, where beef prime rib and teriyaki salmon await. Taking place every Friday from 12.30pm to 3pm, brunch is priced at Dhs345 with house beverages. See asiadecuba.com. î Armarni Deli, Armani Hotel The Il Brunch Italiano at Armani Deli is where rustic flavours meet premium ingredients overlooking the Dubai Fountain for a truly flexible long brunch at your leisure, from lunch until late evening. Expect gleaming glass vitrines filled with classic antipasti, talented Sardinian chefs cooking up your favourite risotto and pasta combinations, or carving a prime cut of beef, a cheese tasting room, crudo bar and delicatessen, live music, and a collection of beverage destinations for all things muddled, spritzed and vintage. The three-hour package is available any time from 12.30pm to 9pm every Friday and is priced at Dhs450 including house beverages and Dhs310 with soft drinks. For reservations call +971 4 888 3666, e-mail restaurant.servations@armanihotels.com. For most people, the definition of ‘good food’ changes depending on how you feel. Sometimes, ‘good food’ means a much-needed hearty pasta dish, and on other days, it means a clean tasty burger, or going for a juicy steak while catching up with your best friend. At the weekends, ‘good food’ might even mean the cheat day from all that working out during the week. Or sticking to the proteins to maintain your summer bod! However, one universal definition of ‘good food’ that everyone agrees on is a big platter of fresh seafood, the yummy sides that just hit the spot and all the time in the world to enjoy your favourite people. Welcome to Joe’s Crab Shack. Throw on your jeans, call up your crew with the juiciest news and head over to Joe’s Crab Shack to crack some crab claws while you guys catch up. Kick back, hang out and enjoy a wide range of mussels, shrimp, lobster and salmon dishes, and of course our world-famous crab. Fancy some wings, steak or something spicy instead? No problem, it’s all there on the menu. And the best part? It’s you, just enjoying good food with good people! Dining deals and happenings in the capital this month. VASCO’S, HILTON ABU DHABI Vasco’s, the nautical-themed beachside restaurant at Hilton Abu Dhabi has launched a weekend special dining package inclusive of a three-course set menu and access to the Hiltonia beach and pool. The all-new ‘Double Treat Specials’ at Vasco’s is available on Fridays and Saturdays, and is inclusive of a three-course lunch meal as well as same day access to the Hiltonia beach and pool for a starting price of just Dhs189. Two more types of packages are on offer for those who plan to have a few drinks as well. At Dhs254 you can enjoy unlimited soft beverages, fresh juices and mocktails; while at Dhs344, there will be a free flow of selected house beverages and classic cocktails. The three-course set menu features Vasco’s salad bar and a dessert platter served at the table. For mains, choose one signature dish from the a la carte menu which includes signature dishes from the land and the sea featuring Indian, Portuguese and African cuisine. For more information or reservations, call +971 (0)2 692 4247. TURTLE BAY BAR & GRILL, SAADIYAT ROTANA RESORT & VILLAS Now open and the newly-launched Saadiyat Rotana Resort & Villas, Turtle Bay Bar & Grill is an ambient restaurant with a stunning rooftop bar and relaxed sounds from live DJs – the perfect spot to watch the sunset. Expect to find surf, turf and grilled delicacies on the menu, to enjoy for both lunch and dinner. At lunch, the outlet takes a more relaxed approach, but as the evening moves sip on lavish drinks from the rooftop terrace with beach views and later enjoy grilled meats or locallycaught fish. For more information or reservations, call on +971 2 697 0000. COYA ABU DHABI, AL MARYAH ISLAND COYA Abu Dhabi is celebrating the summer season in nautical style with its glamorous annual La Noche Blanca White Summer Party in the capital on May 11. Setting its sails for a summer celebration, the international Peruvian restaurant that brought its signature flavours and multi-sensory experience to Abu Dhabi in 2017, will transform into cool white for a Riviera Chic themed party. Known for its cool vibe, guests are invited to sip on COYA’s famous beverages and enjoy the up-tempo beats from special guest DJ Paul Svenson and resident DJ Alonso with percussionist Walter Scalzone. For more information or reservations, please e-mail reservations.ad@ coyarestaurant.ae or call +971 (0)2 306 7000. STARS ‘N’ BARS, YAS MARINA Love tacos? Head to Stars ‘n’ Bars on a Tuesday, where every week from 8pm onwards the restaurant will host ‘Taco Tuesday & Pub Quiz’ night. A great night out for brainiacs and general knowledge buffs. The fun but semi-serious quiz is hosted by the very entertaining quizmaster Darryl Rees. The test of wit begins at 8pm and there are lots of prizes up for grabs, with 2 for 1 specials on taco platters and specials on paired Mexican drinks. For more information call 02 565 0101. RAMADAN PAVILION, EMIRATES PALACE Hosting Iftar and Suhour daily during Ramadan, Emirates Palace’s ‘Ramadan Pavilion’ is custom built and will sit on the Palace Terrace with beachside views. With a large open dining area for Iftar buffets, a separate lounge area and private majlis, guests will enjoy the best traditional dishes. Signature dishes and traditional delicacies of the holy month will be offered in a sprawling buffet every night for Iftar. With live cooking and carving stations to whet every palate, succulent grilled meats with traditional accompaniments and other traditional Emirati favourites, a selection of continental delicacies and an assortment of desserts, the Iftar buffet and à la carte Suhour menu will offer a truly inspiring experience for all senses. Ramadan Pavilion rates are Dhs320 for the Iftar buffet and a minimum spend of Dhs180 for the Suhoor à la carte menu. For more information or reservations, call +971 (0) 2690 7999 or email restaurants@emiratespalace.ae. PAPPAGALLO, LE MERIDIEN ABU DHABI From 7pm to 11pm daily during Ramadan, indulge with Pappagallo’s ‘all you can eat pizza’ deal for Dhs89 per person. Pappagallo awaits with plenty of freshly cooked choices – right from the wooden oven. One house beverage is included in the price. For more information or reservations, call 02 644 6666. Start your day with a fruit for more energy, balance, vitality and taste in your life! Each month, we review four of the city's top tables. Reviewed by Sophie McCarrick Editor of BBC Good Food Middle East, lover of all things food and a keen seeker of new dining experiences. Dining experience: Dinner What’s it like? What are the food highlights? The menu at Morimoto Dubai offers a great range of Japanese dishes, influenced by American flavour preferences. As expected, the selection on sushi on offer is impressive. We opted to start with the signature Morimoto chirashi sushi selection of different fish and vegetable maki and nigiri, which showcased ingredients like spicy tuna, salmon, eel, yellowtail and pickled root vegetable, before moving on to one of my favourite dishes of the evening – surprisingly – the tuna pizza. The flavour-bursting dish came with slices of tuna sashimi on top of a light, crisp base, drizzled with anchovy aioli and sprinkled with olives and jalapeno – all-round very tasty and easy to eat. Next came a light and zingy dish of whitefish carpaccio with hot oil, mitsuba and yuzu soy, followed by a hearty dish of ishi yaki buri bop – yellowtail on rice cooked at the table in a hot stone bowl – a bowl hot enough at over 400°C to sear the fish on the spot. This dish packed a lot of flavour and I’d recommend trying this if you’re looking for something filling. To share, we enjoyed the 300g Australian wagyu striploin with sweet onion garlic jus, which came cut into chunks and was cooked to melt-inyour-mouth perfection. For the lovers of chocolate, don’t miss the melting chocolate sphere dessert that the server flambés at the table, or alternatively, go for the slightly lighter option of s’more’s. How was the service? The team at Morimoto Dubai were friendly and attentive – they ensured we were well taken care of and had a great time. The bottom line: The vibe at Morimoto is alive and uplifting. It’s a fun, chic venue that’s ideal for visiting with a group of friends or with you and your other half. As a tip, the restaurant has several private dining terraces, accessible only by secret password (how cool!) and at the moment we’re told there’s no extra charge for booking these exclusive spaces – I imagine this will soon change once word spreads. Also, make sure to bring your best photo game, as there’s a brightly lit infinity room tucked away in the restaurant, that’s perfect for taking a few Instagram-worthy shots in. Want to go? Priced at around Dhs350 per person for three-courses, without beverages. For more information or to make a reservation, call 04-5125577 or see morimotodubai.com. PIERRE’S BISTRO & BAR, INTERCONTINENTAL FESTIVAL CITY Dining experience: Dinner What’s it like? If you were a fan of the much-loved Reflets par Pierre Gagnaire that sadly closed last year, you’ll be pleased to know that the talented French chef has refurbished the space into something new, with the launch of Pierre’s Bistro & Bar. The re-vamped space is much more casual than Reflets was, however, the same attention to high-quality ingredients and delicious dishes remains. Pierre’s is now a contemporary chic restaurant, bar and lounge that offers sweeping panoramic views over Dubai Creek where you’ll see various impressive laser and water fountain shows each night. Inside the vibe is sophisticated yet relaxed – making it the ideal place to enjoy great food over a few drinks. The space feels much more open now, with a beautiful, feminine colour palette of earthy pinks, greens and golds. Offering a more energised atmosphere, Pierre’s now hosts Dj sets from Wednesday to Saturday each week. cooked superbly. For a real French experience, try the frog legs with creamy poulette sauce. When it comes to dessert, we choose the divine-looking ‘Reflets apple tart’ that I’d spotted on a fellow diner’s table, but our waiter informed that this must be ordered at the beginning of the meal, to our disappointment. Instead, we choose to share the ‘Pierre’s tiramisu’, which certainly didn’t disappoint. The large portion was incredibly light, with airy, fluffy mascarpone, dashed with powdered chocolate – it was delicious. How was the service? The front of house team at Pierre’s offer charming French flair and sophistication. Their professionalism is warm and welcoming, ensuring that your experience is attentive but not intrusive. The bottom line: A perfect date night spot to enjoy high-quality food with your loved one, or as a fabulous catch-up night with the girls. Want to go? Priced at around Dhs300 per person for three-courses without beverages. For more information or to make a reservation, call 04-7011127, e-mail pierres.dubai@ihg.com or visit pierresdubai.com. Dining experience: Brunch What’s it like? rectified once we brought the issue to the team’s attention. The bottom line: Brunch takes place every Friday from 12pm to 3pm. The food in absolutely outstanding and it was a pleasure to enjoy such a wide variety of well-prepared dishes throughout the afternoon. The atmosphere is very low-key. Want to go? Brunch is priced at Dhs395 with non-alcoholic beverages, Dhs586 with house beverages and Italian fizz and Dhs650 with French bubbles. There are also three vegetarian brunch packages available starting from for Dhs350. For more information or to make a reservation, visit atlantisthepalm.com/ restaurants/nobu or call 04-4260800. Dining experience: Dinner show What’s it like? Newly opened Maison Rouge is a lively dinner show concept that serves up a great dose of fun and laughter. Expect a red carpet arrival, before being immersed in a swanky venue decorated in bold velvet reds and gold, that exudes all things burlesque, and fun – lots and lots of fun. Maison Rouge is where to go when you’re looking for an exciting night out. It’s definitely more of a late night spot, paired with upbeat, current music from a live DJ before and after the show. The show starts at 9pm daily, showcasing various entertaining performances throughout the night, including everything from burlesque and cabaret, to magic and hula hooping, plus a talented pianist, saxophonist, and a stunning electric violinist. Expect gorgeous, dazzling costumes on all of the acts, as the entertainment goes from contemporary and modern, to jazzy and classic. We’re told by our server that no two nights are the same and you never know what you’re going to get from the show as the performers like to switch it up night from night. complete with a single red rose. The burger itself is huge and big enough to feed a couple of hungry people. It’s made up on 300g of Angus beef, topped with fresh tomatoes, crispy greens and melted cheese – not forgetting the gold leaf covered brioche-style, red velvet burger bun. And, if there’s room for dessert, the honey cake is absolutely scrumptious. Service is excellent at Maison Rouge. Our server knew the menu inside, out and was always on hand to make sure we had a drink, our plates were cleared and we were well taken care of. The bottom line: Go here when you’re in need of a night filled with laughter with a group of friends. There’s drama, brilliant entertainment and all-in-all, just lots of fun. A taste of Ramadan From Iftar and Suhours, to health advice and gifting tips, this is our foodfocused guide to Ramadan. Welcome the arrival of Ramadan by celebrating the descent of the sun amidst the perfect backdrop of Al Bahou’s stunning 88 Arabic lanterns at the Mövenpick Hotel Ibn Battuta Gate. Bring your family and friends along to ‘The Gate’ and indulge in a sumptuous Iftar buffet inspired by Ibn Battuta’s travels through India, Italy, Morocco and Asia, accompanied by the soothing sounds of a traditional Oud player. Al Bahou’s Iftar will feature a customary range of luscious dates and homemade Ramadan drinks, alongside an extensive spread of traditional Iftar dishes from all over the world. Taking place daily, Iftar is priced at Dhs185 per person. For more information or to make a reservation, e-mail dine.ibnbattuta@movenpick.com. This Ramadan, the Asateer Tent returns to Atlantis, The Palm with the addition of culinary delights from celebrity chef restaurants, Gordon Ramsay’s Bread Street Kitchen and Giorgio Locatelli’s, Ronda Locatelli. Offering both Iftar and Suhoor buffets, the Asateer Tent will showcase dishes designed by each kitchen to pay homage to traditional Emirati cuisine, while offering a modern twist on some classic dishes. The Iftar buffet is priced at Dhs220 per person, which is inclusive of water and Ramadan juices, and Dhs110 for those aged 3 - 12. The minimum spend for Suhoor is Dhs160 per person, with food being served from 9.30pm until 11pm for groups. Guests are welcome to stay and enjoy the tent and its offerings until 3am. For more information or to make a reservation, e-mail restaurantreservations@atlantisthepalm.com or call 04-4262626. Fairuz Arabian Tent, Fairmont The Palm Designed to surround you in the true spirit of Ramadan, the Fairuz Arabian Tent comes alive this Iftar with a delectable buffet and traditional entertainment, whilst its Arabian Courtyard offers shisha and Suhour delights until the early hours. Meaning ‘precious stone’, the gem-like Fairuz Tent is set within the 581-square meter extravagant Palm Ballroom that seats over 350 guests. Decorated in a modern Arabian style, guests can witness an Arabian theme with Moroccan touches, showcasing hues of white, blue, and purple with hints of turquois. The extensive Iftar buffet will provide irresistible traditional delights, indulgent desserts, lavish date displays and Ramadan inspired beverages, while Arabian entertainment will play whilst you dine, with dedicated oud player during the week and eccentric tannoura dancers every weekend. The Iftar buffet will be available at the Fairuz Tent from sunset to 9pm daily during Ramadan for Dhs215 per person inclusive of Ramadan juices. Children 0-5 years old are complimentary and 6-12 years will have 50% discount. For reservations, call +971 4 457 3457 or e-mail palm. dining@fairmont.com. UAE Marriott Hotels During the first week of Ramadan, you can download a 2 for 1 Iftar voucher to avail at participating Marriott International properties. The offer is applicable at nearly 15 hotels including JW Marriott Marquis Dubai, Renaissance Downtown Dubai and more. You can also get a neat deal with their 9+1 group booking offer where you pay for 9, and the 10th person dines for free. Visit ramadanwithmarriott.com to download your voucher or to find out more. IZU Brasserie & Bakery, City Walk This Ramadan the family-friendly IZU Brasserie & Bakery will be extending its opening hours for dine in and take away. IZU Bakery will open from 7am – 6pm and IZU Brasserie will welcome guests to enjoy its a la carte offering from 11-1am. During the holy month the Brasserie will offer complimentary dates to guests breaking their fast and for those who prefer an evening at home, freshly baked goods can be picked up throughout the day to enrich any family Iftar. The menu at the unique Brasserie boasts tasty Mediterranean and Italian favorites for lunch and dinner while the Bakery offers a delectable spread of freshly baked fare, light bites and freshly brewed coffee ideal for a breakfast and brunch. Call +971 4 403 3031. Galeries Lafayette Le Gourmet, City Walk Throughout the month of Ramadan, Le Gourmet - City Walk introduces ‘My Morocco At Your Table’, a concept developed by Le Gourmet Culinary Director Chef Russell Impiazzi in collaboration with Moroccan TV Presenter and Chef Hanane Ouaddahou. The menu will feature an authentic Moroccan daily Iftar for Dhs125. ‘My Morocco At Your Table’ set menu includes a selection of 4 starters, 3 main courses, a dessert platter, tea and house beverages. From 7pm to 2am, every day and there will be a new menu every Sunday. The program is complimented by cooking classes every Sunday where guests can learn how to recreate traditional Moroccan dishes, cooking classes throughout the week, activities for kids including storytelling with the all-round inspiring Amna Al Haddad (the first female Emirati weightlifter, a vocal advocate for mental health and one of the women featured in ‘Good Night Stories for Rebel Girls’), zumba classes (taught by the first certified Zumba instructor with Down syndrome), health talks and more. Ninive, Jumeirah Emirates Towers Ninive, the all-new dining destination at Jumeirah Emirates Towers inspired by the diversity and heritage of the Arab world, has launched special Iftar and Suhoor offers this Ramadan. Combining elements of a garden and a contemporary urban majlis, Ninive presents a menu drawn from across the Middle East and North Africa. Served at the table, in a relaxed and refined atmosphere, enjoy a set menu for Iftar served from 7pm to 8.30pm, which includes soup, cold and hot mezzes, mains and deserts, for Dhs250 per person. As for Suhoor, served from 9pm to 4am, you’ll be able to choose from a special ‘a la carte menu’ for food, beverages and shisha, for a minimum spend of Dhs300 per person. Live entertainment, as well as games such as backgammon and cards, will add to the atmosphere. For more information or to make a reservation, call 04 326 6105 or e-mail info@ninive.ae. Enjoy an Iftar menu with a twist this Ramadan at WAKA. Every day from sunset until closing, a sharing-style Iftar menu will be available priced at Dhs150 per person, inclusive of traditional drinks and water. For more information or to make a reservation visit waka.ae or e-mail reservations@waka.ae. Grand Hyatt Dubai Share the ceremonial breaking of fast with loved ones in the majestic, yet family-friendly setting of Al Ameera Ballroom at Grand Hyatt Dubai this Ramadan, followed by a delectable mixed Sohour in the Laylati Café (Ramadan air-conditioned tent) or an exclusive Ladies only Suhoor – HIA at our Lebanese Awtar restaurant. The decadent Grand Iftar buffet will feature traditional Middle Eastern cuisine and international dishes from live cooking stations accompanied by customary hot and cold Ramadan beverages. Taking place daily during the holy month from sunset till 9pm, Iftar is priced at Dhs210 per person with soft drinks and Dhs105 for children aged 6 – 12 years, while children under 6 dine free. Call 04-3172222. Palermo Restaurant, Dubai Polo & Equestrian Club Discover authentic Arabic traditions and flavours in a contemporary set-up at Palermo restaurant while enjoying a family style buffet. Celebrate the breaking of fast with fresh ingredients and treats displayed in a buffet set-up. Taking place from May 15 to June 14 daily from sunset to 9pm, the Iftar buffet is priced at Dhs155 per person or Dhs80 per child. For more information or to make a reservation call 04-361811 or e-mail info@poloclubdubai.com. Ramadan Al Andalus Tent, Fairmont Bab Al Bahr In celebration of the Holy month of Ramadan, Fairmont Bab Al Bahr, Abu Dhabi is once again opening doors to one of the capital’s largest and luxurious Al Andalus tent. Authentic Iftar offerings and Sohour experiences are complemented by traditional entertainment, all against the staggering backdrop of Sheikh Zayed Grand Mosque. Inside, the buffet features a seafood and meat BBQ station, including prawns, scampi, mussels, crabs and a selection of freshly prepared fish; whole lamb carving station; Arabic buffet, including hot and cold Mezzeh; freshly made Arabic bread and Manakish; shawarma rolled in Saj bread; lamb and seafood Ouzi; home-made Emirates station, including Thareed, Harees and Machboos; selection of Arabic soups; traditional Ramadan Drinks; Arabic and Western sweets, including chocolate fountain, Kunafa station and Arabic Ice cream; premium dates and Arabic Coffee. Taking place daily from 6pm to 9pm, Iftar is priced at Dhs235 including water, soft drinks and juice. To follow, Suhour will take place from 10pm to 3am and will offer an a la carte Lebanese menu accompanied with a live oud player. Suhour is available for a minimum spend of Dhs180 per person. To make a reservation, e-mail dining.bab@fairmont.com or call 02 654 3238. Nosh, Mövenpick Hotel Jumeirah Lakes Towers This Ramadan, Mövenpick Hotel Jumeirah Lakes Towers brings light to an Iftar buffet rich in Arabian heritage, traditions and flavours, along with a chance to win a trip to the healing waters of the Dead Sea, Jordan. The breaking of fast, graced with lakeside views will satisfy discerning palates over a luscious Iftar spread of Arabic and international favourites – from a healthy selection of fresh salads and traditional hot and cold mezzes, to meaty kebab grills and lamb ouzi carving as the centre piece. Live saj stations, refreshing Ramadan juices and a delicious spread of desserts with kunafa, mm Ali and baklava will take you on a journey through the beauty of Arabian heritage. Each Iftar diner will get a chance to win a trip for two to Jordan, inclusive of round-trip flights and a five nights’ stay at Mövenpick Resort and Spa Dead Sea, Jordan. Nosh’s Iftar buffet is served throughout Ramadan from sunset to 10.30pm for Dhs139 per person, including soft drinks and Ramadan juices. Kids under 6 dine complimentary, while those from 6 to 12 get 50% discount. Group reservations of 10 or more and companies can avail special rates. For more information or reservations, call 04 438 0000 or visit movenpick.com/jumeirah-lakes-towers. Amaseena Majlis, The Ritz Carlton, Dubai Amaseena’s Arabian allure finds new expression this Ramadan, at an enchanting, new Ottoman-styled Majlis at The Ritz-Carlton, Dubai. Blending traditional Arabic essences with contemporary refinement Amaseena Majlis transforms the Lou Lou’A Ballroom of The Ritz-Carlton, Dubai into a Majlis that will be serving both Iftar and Suhour throughout the holy month. An intimate ambience sets the stage for Chef Rami’s culinary art, from inventive fusions such as Mandi-cooked salmon and traditional favourites flavoured with hand-roasted spices, to tagine cooked in authentic clay cookware. A lavish spread across nine food stations highlighting the best of Middle Eastern cuisine will have guest spoilt for choice, from Moroccan to Lebanon and Gulf to Persian and other international delicacies like Peruvian and Italian, garnished with a medley of oud and violin music and extensive shisha flavours during Suhour. Iftar (Dhs225 per person) will take place daily during Ramadan from sunset to 8.30pm, while Suhour (Dhs160 per person) will take place from 10pm to 2am. For reservations, e-mail dine.dubai@ ritzcarlton.com or visit ritzcarlton.com/Dubai. The Retreat Palm Dubai MGallery, Palm Jumeirah The Middle East’s first holistic wellbeing resort, The Retreat Palm Dubai MGallery will embrace the spirit of Ramadan during the holy month by taking guests on a serene journey to wellbeing with a unique Iftar journey custom-made to fulfill everyone’s needs. Much like the bespoke retreat packages the wellness resort is famous for, during the month of Ramadan guests can choose his or her own small wellness ritual to recover, revitalise, detox or more. Available at the Vibe Restaurant and Wellness Lounge from May 15 to June 14, from 7.30pm to 9pm, the Iftar is priced at Dhs225 per person with beverages and access to the Wellness Lounge with one activity. For reservations, call 04 524 7777.
and reinforces its Mediterranean credentials. Highlights include the ‘healthy green bowl’ - a healthy vegan bowl with quinoa, grains, spinach, kale, green peas, asparagus, avocado, broccoli, green tomatoes, French beans, mixed seeds and zingy lemon dressing and the ‘tiger prawn risotto’ - jumbo tiger prawns on a bed of venere black rice renowned for its health benefits and trumpet mushrooms with Parmesan Reggiano cheese. Guests looking for a sweet treat can delight in a choice of four seasonal desserts including ‘pomelos cheesecake’ - a crispy biscuit base topped with cream cheese, grapefruit, yuzu, strawberry purée and cream cheese mousse or the irresistible ‘apricot and milk chocolate cake’ with crunchy almond biscuit and layers of apricot and yuzu compote, topped with milk chocolate cream. To beat the summer heat, the menu showcases refreshing chilled beverages including the ‘peach delight’ - a tasty blend of peach with orange, apple and strawberry, providing the quintessential taste of summer for all of the family to enjoy. Ramadan The Queen Elizabeth 2, Mina Rashid Experience Iftar aboard The Queen Elizabeth 2 this Ramadan, as the ship opens an Arabian majlis offering a unique Iftar and Suhoor that combine traditional Middle Eastern flavours with a royal service experience. The purpose-built majlis, which is located on the ship’s largest deck, can host up to 250 people and offers patrons an expansive Arabian buffet including live cooking stations, traditional Emirati dishes, fresh salads, hot and cold mezze, and abundance of desserts and a selection of classic Arabic juices and coffee. The Iftar buffet opens from sunset until 9pm and is priced at Dhs250 per person, Dhs125 for children below 12 and is complimentary for children below 4 – inclusive of buffet, soft drinks and water. The Suhoor buffet is open from 9pm until 1am and costs Dhs175 per person, Dhs85 for children below 12 and is complimentary for children below 4 – inclusive of buffet, soft drinks and water. For reservations, e-mail dining@qe2.com or call 04 526 8888. Ranches Restaurant, Arabian Ranches Golf Club For a family-friendly Iftar this Ramadan, head to Ranches Restaurant offering lakeside views over the fairways. Savour Arabic delicacies in fresh, light and contemporary interiors and enjoy a specially created menu of international dishes served specially through the blessed month from May 15 to June 14, daily from sunset to 8.30pm. Priced at Dhs159 per person, Dhs85 for children between 6 – 12 years, and children below 5 years dine with compliments. For more information, call +971 4 360 7935 or e-mail restaurant@arabianranchesgolf.ae. The Bvlgari Majlis, The Bvlgari Resort Dubai Designed as a destination to feel like home, The Bvlgari Majlis will launch for the first time this Ramadan, with the ability to seat up to190 guests for both Iftar and Suhour, and it’ll also offer an intimate VIP section for 12 guests for a more exclusive private dining experience – all overlooking the world’s first Bvlgari Marina and Yacht Club. From those archetypal Ramadan dishes such as ouzi, shawarma, umm Ali and an array of eight kinds of dates, to the Italian classics with gelato, Iftar will ensure guests enjoy a true fusion of classic Italy in Arabia. The Bvlgari Majlis will be open throughout Ramadan from sunset to late night. Iftar is starting from Dhs250 per person, inclusive of all food and drinks, while Suhour will offer on an a la carte basis with a minimum spend of Dhs185 per person – inclusive of soft drinks and juices selection. Children from 12 to 16 years old dine for half price and under the age of 12, on a complimentary basis. For reservations, call 04-7775433 or e-mail dine@bulgarihotels.com. Ostro, dusitD2 Kenz Hotel Barsha Heights This Ramadan, step inside the bright and spacious Ostro restaurant at dusitD2 Kenz Hotel in Barsha Heights for a hearty Iftar buffet, created with whole food ingredients and locally sourced fresh food that is further embellished with nutritious greens. In line with its focus on wellbeing, Ostro’s Iftar menu consists of selected nourishing soups, cold mezzeh, cold appetizers, salads, hot mezzeh, Mediterranean and Arabic main courses, as well as traditional Emirati dishes. Also included are live cooking stations, and desserts that include both traditional Arabian delicacies and gluten-free pastries and puddings. Taking place daily during Ramadan from sunset to 9pm, Iftar is priced at Dhs139 for buffet, drinks, coffee and tea, children under 6 eat for free (max 2), and children from 6 to 12 years old eat with 50% discount. For reservations, call 04-5672246 or e-mail ostro@dusitd2kenz.com. Ramadan Bateel’s Jumeirah Chests and Royal Turquoise Drawer gift boxes add vibrancy and a chic element to the time-honoured practice of gifting, each of the offerings are generously filled with a fine selection of Bateel’s Gourmet organic dates. Priced at Dhs385, Bateel’s Ramadan collection is available at all Bateel Boutiques across the UAE. These Hag El Leila Lantern Hampers come in various sizes are are filled with a variety of premium candies, dates, lollipops, chocolates and more. Priced at Dhs150 and Dhs200 from Candylicious, The Dubai Mall. This year Marks & Spencer has an impressive range of delicious food hampers to choose from, like ‘The Ultimate Gold Collection’ hamper pictured. Priced at Dhs349, expect to find goodies like a Belgian biscuit selection, dulce de leche truffles, cocoa dusted liquid salted caramels and much more inside. Available from all Marks & Spencer stores in the region or online at marksandspencerme.com. This Ramadan, Angelina Paris in the Dubai Mall is offering beautiful gifting ideas, hampers and a special pastry crafted exclusively for the holy month. Hampers are available in several ranges and can be customised as per a customer’s preferences including a variety of products including hot chocolate, chocolates, Angelina tea infusions, chestnut cream and more. Give the gift that keeps on giving this Ramadan, with the new Nespresso Lattissima One machine. Whether for a black coffee or a creamy Cappuccino, this machine provides the perfect convenient, compact and easy to use solution for all coffee lovers. Priced at Dhs1,443.75, the Lattissima One is available to purchase at Nespresso boutiques and online at ae.buynespresso.com. Popcorn clusters enrobed in silky smooth chocolate presented in a special Ramadan Gift Box will make perfect gifts this Ramadan. With prices starting from Dhs158 for a gift box, to Dhs1,575 for a Bonbons Tower, from Garrett Gold. With an increased focus on healthy options during the Holy month of Ramadan, Mirzam has created an entirely vegan collection which includes several items made using 100% dark chocolate combined with fruits or dates. The dairy-free range of healthy treats, features dark chocolate creations with no less than seven recipes, made with UAE-grown dates and intensely flavoured freeze dried fruits. The Ramadan 2018 Collection is available online at mirzam.com or from the Mirzam store in Al Quoz. an abundance of sweet endings, as well as an international selection of hot and cold beverages, to celebrate the rituals and flavors from around the world. Chef Mark Elias Born in a hospitality oriented region in Al Yazidiya, Syria, Chef Mark apprenticed in one of the many restaurants in the village during Summer breaks. This made him yearn interest in the Levantine cuisine from a young age. He cumulates 10 years of culinary experience and over the years has worked his way up through some of Dubai’s prestigious 5 star establishments and now as a Sous Chef in the Arabic Kitchen at Sheraton Grand Hotel, Dubai. Fasting during the holy month can take a negative toll on your health if not done correctly. Becky Balderstone the founder of Ripe, the UAE’s leading provider of fresh, local organic fruits and vegetables, shares tips to bear in mind during Ramadan, to help you stay in tip top shape. fasting. Skip on fizzy, sugar-laden drinks and opt for drinks like coconut water, green juices, a cup of matcha tea and lots of water, which will ensure that you are hydrated and ready for the day ahead. Try something different To refuel your body well, try breaking your break your fast with a power smoothie. Adding superfoods such as spirulina, matcha powder, acai powder, chia seeds, baobab powder combined with coconut water, avocado, berries and bananas will not only give your body the extra fuel that it needs but it will also ensure you have the essential antioxidants to protect you from fatigue, and any looming bugs going around. Seek your doctor’s advice Before drastically changing your diet and routines, schedule an appointment with your doctor to be safe. They can best advise what is most suitable to your body. Snack mindfully If you fancy a snack in between meals, try and avoid salty, highlyprocessed snacks that can leave you feeling thirsty and lethargic. Choose snacks that’ll give you energy, like nuts & seeds, dates & trial mixes, and raw protein balls. Don’t cut out all exercise Stopping your workouts during Ramadan is not recommended, instead try to incorporate gentle workouts into your routine such as yoga and swimming. Ensure each meal is carefully thought out with foods that will support your fast, slow burning foods will keep your energy high and your hunger at bay. High-fibre carbs such as quinoa, brown rice and wholegrains are a great choice, with lots of nutritious fruit and veggies to ensure that you have as many nutrientrich vitamins and minerals as possible. To go with that, I’d recommend consuming lean protein such as chicken, tofu, fish and eggs. The BBC Good Food Middle East Awards are back for the ninth year to celebrate the best in food from across the region, as voted for by you. With over 60 categories to vote in, featuring new awards for Oman, Bahrain, Kuwait and Saudi Arabia. Vote now for who you think serves the best food around and you could be heading to the Seychelles! For a chance to win a holiday for two at the DoubleTree by Hilton Seychelles – Allamanda Resort & Spa worth Dhs10,000, all you need to do is hit the ‘share’ button after you have cast your votes online! WIN A DREAM HOLIDAY IN THE SEYCHELLES WORTH DHS 10,000! * VOTING CLOSES 8TH NOVEMBER 2018. Curry jargon decoder Tempering means to extract the full flavour from spices by heating them in hot oil. When making a curry, spices tend to be tempered at the start of the cooking process, whereas, for dhals, tempering is usually done at the end of cooking. Roti means bread, so the type of bread you choose is generally up to you. Chapatis – flatbreads made with atta (wholemeal) or maida (plain wheat) flour – are the most common types of roti. Rempah means spice in Malay, but also refers to the spice paste made with garlic and shallots that is used as a curry base. Satini pomme d’amour is a chutney that is usually served with curries in Mauritius. Tamarind The pods of the tamarind tree are used extensively in South-east Asian and Indian cooking to add a unique sweet and sour flavour. It is sold in paste and block form. To prepare block tamarind, tear off a chunk and soak in warm water for 10 mins, then squash with your fingers and strain through a fine sieve. Discard the pulp and use the liquid. To use tamarind paste, mix 15ml of tamarind with 4-6 tbsp warm water. 1 Melt half the butter in a frying pan with a lid. Fry the shallot for a couple of minutes, then add the chicken and carrot. Fry the veg until starting to brown, then add the cinnamon and lemon, and season well. Stir in the rice and raisins, then add the stock and bring to a simmer. 2 Scatter the chickpeas on top, then cover with the lid. Cook for 15 mins over a low heat until the rice has absorbed all the stock – if the rice is still firm, add 50ml water. Stand for 5 mins, then fluff up the rice. Dot over the remaining butter, then serve. If you cool the filling completely, you can add the pastry and freeze the pies uncooked. You can use a white miso soup sachet if you can’t find the paste. Comptoir 102 to host breakfast talk with philanthropist Juliette Dumas On May 14, Comptoir 102 will be hosting a special breakfast talk with the renowned French author, speaker and philanthropist Juliette Dumas, that will bring focus to obtaining greater self-belief and understanding. Juliette, raised abroad but truly Parisian, will give guests tips to enhance their inner light through a fulfilling program with her talks and workshops. Juliette offers ‘shine therapy’ inspired by her state of mind. “It allowed me to better live my life, to resist storms, to overcome obstacles and to tame my fears. Fear can slow you down, block and pollute, but fear does not like the light, even less the inner light that we all have in inside us and the desire to just want to shine,” commented Juliette. Her book “Feel the sun one minute a day even if it doesn’t shine” published in French and soon to be published in English, is a reference in positive state of mind philosophy and in understanding your own strengths, leading to a strong well-being and a happier life. The breakfast talk is priced at Dhs120 per peron, which will include entry, an energy kick juice and a crème budwig. To reserve a spot, e-mail gossip@ comptoir102.com or call +971 4 385 45 55.
category, demand has been on the rise. The Ripe range of superfoods, including smoothie mixes, is organic-certified. Everything is 100% natural, made with minimal processing, no preservatives, dyes or regulators, assuring the highest level of quality and nutrient integrity. In-store, you’ll also find a huge variety of fresh organic fruits and veggies, nut butters, nuts & seeds, and more. Products from Ripe can be ordered online at ripeme.com or in-store at Park Centre Mall in Mirdif, Shoreline 8 GF at Palm Jumeirah, Town Centre Mall at Jumeirah, and at Al Manara, Umm Suqeim. Maintaining your health during Ramadan Let’s be honest, fasting is not easy. And, fasting followed by feasting equals a bad combination, so it is important to take good care of your body and mind during Ramadan. Here are a few healthy guidelines from the medical expert at Clinique La Prairie Spa, Dr. Lopez the medical director), to bear in mind during the holy month: Detox with tea Try to drink a herbal green tea after your heavy meal and before your Suhour meal every morning, to keep your body hydrated and purified in a healthy and natural way, eliminate excess fluid and awaken your metabolism. When enjoyed every day throughout the year, green tea can also slow down ageing and give your body new found energy, along with reducing the feeling of hunger. Vitamin rich diet Have a balanced diet rich in protein and vitamin. Your meal should include vegetables, fruits rich in vitamins (orange/kiwi/lemon) with carrots (vitamin A) and cereals which are a source of Vitamin B.
sugar in blood, leading to possible diabetes and obesity. As spicy food weakens digestive strength, try to opt for mint, infusions of fennel, basil, chamomile and cardamom which are easier to digest. Sleep cycle If you manage a good healthy diet with decent physical activity, you will be able to regulate an 8-hour sleep pattern which is imperative as the body is in fasting mode. For a good night’s sleep, use an infusion of verbena, chamomile and hot milk. For more information about Clinique La Prairie Spa in Switzerland (pictured), call +41 21 989 34 81, or e-mail reservation@laprairie.ch. Reinventing the traditional concept of beef and chicken fajitas, the Latin American and Mexican restaurant Poco Loco, introduces its signature healthy dish the ‘Veggie Fajitas’. Prepared with steamed fresh mushrooms, cooked onions and bell peppers, the flavourful dish is a healthy balanced meal that can be served with tortillas, sour cream, guacamole and cheese offering your little ones the chance to add their favourite toppings to their meal. This dish is one of the easiest to prepare at home and is not restricted to the ingredients as any kind of your kid’s favourite vegetables can be added to the colorful mix like zucchini, cauliflower, tomato and corn. Priced at Dhs92. Call 04 456 2081. The Farmhouse launches UAEgrown pesticidefree produce A new UAE fresh food producer, The Farmhouse, has launched its inaugural line of locally grown, pesticide-free vegetables. The vegetables are being grown locally, in Ras Al Khaimah. They are picked, packaged and delivered to supermarket shelves across the Emirates in less than 24-hours, giving residents a new option for high-quality, ultra-fresh vegetables at a competitive price. The inaugural selection of produce comprises beef tomatoes, cherry tomatoes, capsicums, cucumbers, green & yellow zucchini, marrow and Galia melons. The Farmhouse has partnered with Barakat Group to supply multiple product varieties. All of The Farmhouse’s crops are being grown in the controlled environment of its 430,000-square-foot (4 ha/10 acres) greenhouse hydroponic farm in RAK. The first phase of the facility was completed and produced its first harvest in March 2018, with crop production ramping up this month. When all crops are in harvest, The Farmhouse will supply over 25 tonnes per week of best-in-class vegetables for local consumers. A second phase expansion to over 1 million square feet (10 ha/25 acres) will commence later in 2018. Hydroponic technology uses micro-irrigation to deliver nutrient-enriched water to plants. “Our hydroponic ecosystem is the key to The Farmhouse,” said operations director Esteban Barrachina, a third-generation hydroponic farmer. “It allows us to control all aspects of our greenhouse environment, so we never need to use pesticides or chemicals. We are able to closely monitor growth of our vegetables and harvest at the peak of their freshness.” For more information, visit thefarmhouseuae.com and follow for updates on Instagram or Facebook at @ TheFarmhouseUAE. At Cocoa Kitchen, chefs use cocoa in their signature salad bowls to give flavours a sweet uplift, making it perfect for little ones. So, if you’re looking to try a tasty salad head to the outlet and try the detox on nibs salad. The scrumptious yet healthy bowl is complemented by ingredients such as avocado, pomegranate, carrots, and red, black and white quinoa, plus brown rice, mixed lentil grains, sunflower seeds, red cabbage, kale, coriander, cashew nuts and broccoli, replete with rich cocoa nibs creating a well-balanced and delectable flavour. Priced at Dhs35. Call 04 343 2506. For a healthy and fulfilling meal look no further than Homestead Restaurant and Bakery’s Diyay Tahta (traditional Emirati Biryani). The dish offers a wholesome and nutritional meal, offering a balanced palette of ingredients like dried fruits and nuts, tomato paste, and soft baby chicken. Priced at Dhs65. Call 800 HOMESTEAD (466378323). For the little ones, the Khameer Bread with Falafel at SIKKA Café guarantees to offer children a tasty yet healthy meal. The sandwich is made with khameer bread, and its fillings include falafel (vegetarian fritters), lemon, tomato and Rocca leaves giving it an added zest of flavours. Priced at Dhs32. Call 04 385 6524. BARE Fitness, Business Bay Meal planning, support and high intensity group training, BARE is a nutrition-focused, transformative centre famous for dramatic fat-loss and extreme fitness performance. With one studio in Business Bay, BARE has become best known for their #TrainBLACK classes, which combines high intensity fitness, training with sculpting weight lifting, pumping playlists and an electric atmosphere. Unrivalled for calorie burn and energy, #TrainBLACK is so much more than just a workout. WHEN? Daily at various times. See www.bare. fitness for full timetable. HOW MUCH? Dhs800 for a monthly membership. BOOK YOUR CLASS: Call 05-44550597. DRYP Hot Yoga, Dubai Marina Love yoga and fancy giving something new a try? DRYP is Dubaiâ&#x20AC;&#x2122;s hottest (literally), yoga studio to recently open to offer Traditional Hot Yoga + Hot Fitness classes that have power to transform you. Unlike traditional heat systems, DRYP uses the latest infrared heat technology in the classes, which gently warms up your body instead of the room and comfortably maintains a consistent temperature throughout your workout. DRYP welcomes everyone regardless of age, fitness or flexibility levels. WHEN? Daily at varied times, see dryp.ae for timetable. Classes are 60 minutes and 90 minutes. HOW MUCH? Dhs 150 for seven days unlimited. BOOK YOUR CLASS: Call 04 220 5330. Aquaspin is the latest revolutionary aqua exercise that’s kind to the joints and muscles, yet burns the calories and improves cardio vascular fitness. The 45-minute class involves cycling on state-of-the-art spin bikes submerged inside the water. Cycling under the water is not only different but is extraordinarily rewarding and burns those extra kilos. The early morning and evening classes seven days a week are the perfect way to cool off and have fun. AquaPower classes focus on strength, cardio and combat movements in water – with water weights to increase strength and powder. AquaEndure classes focus on mainly on endurance and speed, this class is all about stamina, with longer sets and lighter resistance. WHEN? Every day, morning and evening. HOW MUCH? Dhs75 BOOK YOUR CLASS: Call Fairmont The Palm’s Health Club on 04-4573330 or e-mail palmdubai@fairmont.com. Adidas Runners Club, all around Dubai If you’re a running or looking to get into running, the Adidas Runners Club is one to try, operating all over Dubai in locations like Dubai Marina and Kite Beach. Adidas connects like-minded people looking for more than a run club, both in their hometown and around the world, so you can keep with the fun when you’re travelling too. The club offers personalised training plans, expert coaching and exclusive experiences help members smash goals, celebrate success and have fun doing it WHEN? Daily at different times and locations. BOOK YOUR CLASS: Visit mena. adidas.com/adidasrunners/en_AE/dubai for more information and to book directly. WIN OVER AED35,000 IN PRIZES THIS MONTH! SUBSCRIBE NOW for only Dhs150 and get 12 issues for the price of 10! Bank Name - Emirates NBD SWIFT Code - EBIL AEAD Bank Address - Al Souk Branch, Dubai, UAE Fax copy of transfer advice to +9714-4472409 or Please send a copy of transfer receipt to david.johnshaju@cpimediagroup.com. Terms & Conditions Magazine subscription will begin with the following months copy of the magazine after payment has been made and delivery address confirmed. Magazine subscription cannot be cancelled or refunded. MAGAZINE RETAIL PRICE IS DHS15 PER MONTH AT ALL LEADING SUPERMARKETS, BOOKSTORES AND PETROL STATIONS. Excessive sun exposure can cause wrinkles, age spots and even detrimental diseases such as skin cancer. Using a broad-spectrum sun cream that contains physical filters and can protects your skin from UVA/UVB rays is vital, as this can reduce the risk of skin damage and keep your skin looking youthful. Also, it is highly recommended to re-apply sun cream every two hours, especially if you will be engaging in outdoor activities such as swimming. We all know that smoking in general is harmful for the body, but did you know it could make your skin age as well? Smoking narrows blood vessels in the outer layers of skin, which decreases blood flow and makes your skin look paler. It can also deplete the skin of oxygen and nutrients that contribute to healthy looking skin and damage the natural collagen responsible for skin elasticity. Thus, it is highly recommended to stay away from smoking to prevent the skin from aging earlier than anticipated. natural oils and cause further damage. Choose products that are natural, paraben and preservative free, mineral oil free, silicone free, alcohol free and are vegan certified. 2-night stay at La Ville Hotel & Suites! to meet and mingle. Guests can rely on a warm and personalised service with surprising cosmopolitan and social experiences, tailored to individual preferences and moods. Dining is a key highlight and with three restaurants, a lobby cafĂŠ and rooftop bar boasting mesmerising skyline views, La Ville Hotel & Suites is for everyone, the sophisticated experience seeker, frequent traveller or stylish socialite looking for a lively urban setting. The prize draw for a 2-night stay at La Ville Hotel & Suites will be made at the end of May 2018. Prize certificate cannot be exchanged for cash, is not transferable, is not for resale. Booking in advance is required and subject to availability. to enter this competition and simply answer this question: Where is La Ville Hotel & Suites located? *Terms & conditions apply. Flights are not included in this prize. Employees of CPI Media Group are not eligible to enter. Winners will be selected on random basis from correct entries. SCAN THIS QR CODE TO GO STRAIGHT TO OUR WEBSITE.
! WIN 3-night stay at The Residence Mauritius! service worthy of the grand colonial houses of yesteryear. Dine on exotic cuisine that captures the incredible potpourri of island flavours. Discover new secrets to soulful relaxation within our serene spa sanctuary, and an endless playground of attractions and activities to be found in the islandâ&#x20AC;&#x2122;s unique mix of cultures and stunning landscapes. The prize draw for a 3-night stay at The Residence Mauritius, will be made at the end of May 2018. Prize certificate cannot be exchanged for cash, is not transferable, is not for resale. Booking in advance is required and subject to availability. Transportation to Mauritius is not included. to enter this competition and simply answer this question: Which coast is The Residence Mauritius located on? *Terms & conditions apply. Flights are not included in this prize. Employees of CPI Media Group are not eligible to enter. Winners will be selected on random basis from correct entries. COMPETITIONS Fabulous prizes, from dining vouchers to gourmet goodies, up for grabs. Experience contemporary dining that combines French elegance with comfort, offering Normandy inspired brasserie cuisine in a relaxed atmosphere. Catering to the refined palettes of the welltravelled, Brasserie du Park prides itself on providing wholesome dishes, representing simple yet genuine flavours. Choose from a wide set of modern and classic flavours like Lotus Biscoff, Nutella Marshmello, Nutella Caramel, Bubble Gum, Kit Kat, Strawberry and Mango Milkshakes. A 1-NIGHT STAY AT DANAT AL AIN RESORT FOR 2 WITH BREAKFAST! Danat Al Ain Resort is located in Al Ain, the famous ‘Garden City of the Gulf ’, a haven of peace and tranquillity. The 5-star property features over 216 rooms, spacious suites and villa with an option of overlooking the swimming pool or wonderful Jebel Hafeet Mountain range. The resort encompasses a choice of seven restaurants serving Intercontinental to fresh and modern Indian cuisines and the very famous Irish spot Mcgettigan’s. Boardwalk is a family friendly, beautiful Creekside restaurant, nestled on the shores of the idyllic Dubai Creek Marina. With its marina inspired interior and a cosy terrace offering spectacular views across the Creek, the iconic restaurant features a striking fresh seafood display reminiscent of a Mediterranean market. Win a chance to experience the sumptuous Iftar buffet with a Polynesian twist for 4 this Ramadan at Kalea restaurant in Lapita hotel, Dubai Parks and Resorts. This cooking cream is brand new to the market. Made from Italian milk and very importantly, it is hormone free. Koita is already stocking some of the best restaurants and cafes with this product and it is great for use at home too. To be in with a chance of winning these prizes, visit our competitions page on www.bbcgoodfoodme.com, or simply scan this QR code with your mobile to go directly to the website, and answer the simple questions. *Terms & conditions apply. Employees of CPI Media Group and entrants below 21 years old are not eligible to enter. Winners will be selected on random basis from correct entries. EuropEan dairy products The tastiest moments of your day!